There really isn’t much to say about Planet Coaster at present, as in a word it defines “great”. I don’t use that lightly, and the game at present does have some issues aside from it being currently unfinished, but the core gameplay is rock solid. 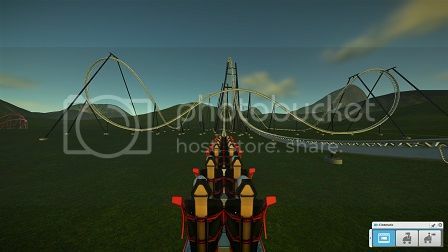 Planet Coaster is an amusement park simulator for the 21st century, the game is in full 3D, you can control the camera fully, place rides anywhere in the space, and both ride amusement rides in first person (which is par for the course with these types of games), but also enter a first person mode of a guest of your park to get their view on it. I think this last feature is unique to this game, or at least I haven’t seen it before in this type of game. At present there are only two real game modes in the alpha build, challenges and sandbox and the sandbox is where I spent most of my time. You’re given a plot of land, infinite cash and that is it. The crux here is that unlike most theme park games, the tools here are fun and intuitive to use. The path tool for instance is a tad weird, you can’t create very long sections of path for visitors to walk on, but there’s actually a kind of genius here because the tool is great at bending to your whims at any direction. I’ve noticed a lot of times paths (or streets if you want) can get messed up due to awkward turns, because the tool can’t handle abrupt corners. Not so in Planet Coaster, their path tool lets you make a path to anything, and will curve and bend, sometimes to impossible angles, to accommodate what you are trying to do. You can plop down buildings and they will also add in a path to them to your main routes through your park. Larger rides like an actual coaster require some placement like entrances , exits, ticket vendors, etc., but it’s all intuitive, which is helpful since the preview build doesn’t have a tutorial, though the full game will. Customization is the name of any good simulation game, and Planet Coaster has it in spades. 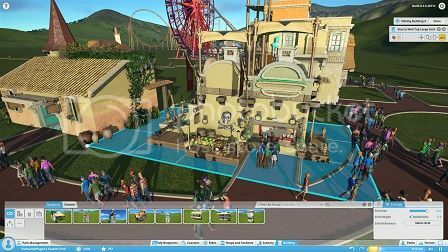 You can design your own coaster, like most of these games, but you can also customize different buildings like restaurants and gift shops that populate your park. This lets you get very creative with what you really want to do, and thanks to the Steam Workshop support, you’ll be able to see other people’s creations. There are some quirks to the game, nothing bad, but just odd things. If you try to hold the pathing tool down, it instead goes to elevation, and not for longer stretches of path. 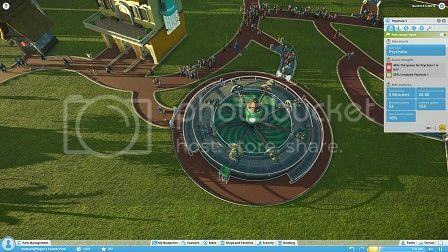 The initial starting area for the park is a tad small, at least once you start laying down coasters, but I imagine it expands later on. There isn’t that many themes for parks yet, but again, it’s a preview build so they’ll likely throw in more for the full version. It’s all extremely minor stuff in the grand scheme of things though. The game will be officially released on November 17th.